Hey, you know how you’re always talking about how you want to see a movie where a giant living teddy bear has the voice of Robbie Coltrane and also Eugene Levy is in it for some reason? Well, have we got a surprise for you! Meanwhile Stu sings a love ballad, Dan reveals Elliott’s corporate espionage, and Andy just wants to talk Ducktales. 0:35 – 4:28 – We introduce guest host Andy Rocco, and challenge him to justify himself. 4:29 – 47:22 – We find a surprising amount to talk about in Gooby, almost managing to keep to the topic. 47:23 – 50:06 – Final judgments. 50:07 – 55:57 – The sad bastards recommend. 57:58 – 58:57 – Plugs, goodbyes, theme, and outtakes. 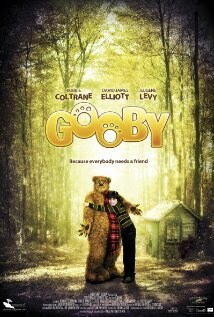 Wikpedia (not-really-a) synopsis of Gooby. I’m sure it just had something to do with Penny meeting/fighting a dinosaur. Was it the same guy? That would be terrific. Something about you guys having to watch “Gooby”, and Stuart actually actively paying attention, made me feel bad enough to toss Dan a few more bucks by way of donation. Just seeing the movie posters gives me shivers. Steventean has not yet contacted us. Too deviant for DeviantART. Permanently. years late to comment but Fantasy Mission Force is, in fact, amazing. I recently Googled “Gooby scary face” and Gooby’s face actually deeply disturbed me.